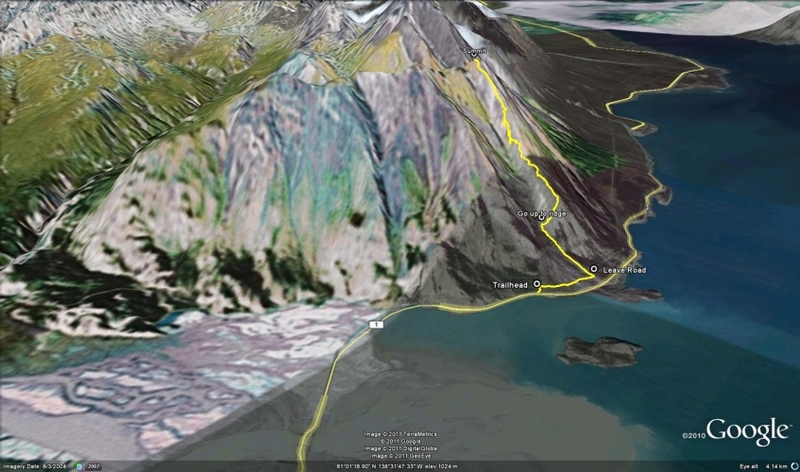 This trail is much steeper and more strenuous than the Sheep Creek trail, but you get a view overlooking Kluane Lake and the surrounding mountains the entire time. You don't get a view down the Slims River as you do on the Sheep Creek trail. From Haines Junction, continue on the Alaska Highway north for about 70 km until you cross a bridge and see the Thachal Dhal (Sheep Mountain) Visitor Center. About 1.5 km after the visitor center is a parking lot on the left (west) side of the highway for Soldier's Summit. Park here, the trailhead is to the right. There is another parking area and trailhead further down the highway with a slightly easier approach avoiding the scree ridge described below (about 3 km from the visitor center). The trail starts right across the highway and follows a steep grassy ridge. Walk up the trail for Soldier's Summit and turn right at the park bench. You will be walking along the old World War II Alaska Highway (more of a rocky, dirt path). After about 600 m, there is a foot trail on your left that leads up a hill and into the trees (the trail is not marked, but is well worn, so just watch for it). Follow this trail for about 700 m until it peters out and you are below a scree ridge. You want to be on top of the ridge to your right, so switchback up the steep scree until you reach the top of the ridge. Once you are on the ridge, you can follow it up to the summit. Looking up, you will be on the right-most ridge - the one with the rocky outcrops near the top. It is easiest to stay on the left side of the ridge. Sheep and grizzlies are often seen along these ridges, so keep an eye out for them. Try not disturbing any wildlife - if they are in your way, circle around them or wait for them to leave the area if you want to continue. Note, dogs must be on a leash in the park. At the summit, you get a 360 degree view of the surrounding area. You can turn back down the ridge and follow the same way down, or do a circle route over the ridges to the southwest and down the Sheep Creek Trail. If you decide to do a circle loop, it is best to have 2 vehicles and park one at the Sheep Creek trailhead. Have you been to Sheep Mountain lately? If anyone is going to split up on this trail with part of the group going up over Sheep Mountain and connecting with the other part of the group on the back side from Sheep Creek, make sure to take radios to be able to communicate back and forth. This was our plan, but we found out we forgot the radios. The trail took us longer to do than recommended here. Finding the connecting point off Sheep Creek was a bit of a challenge, and we used air horns to signal back and forth until we were able to get together. Going over the top on Sheep Mountain really requires topographical skills. We have a great memory there, but it was a bit iffy at points. And yes there's high grizzly activity off of Sheep Creek Trail. I would definitely recommend this trail though. 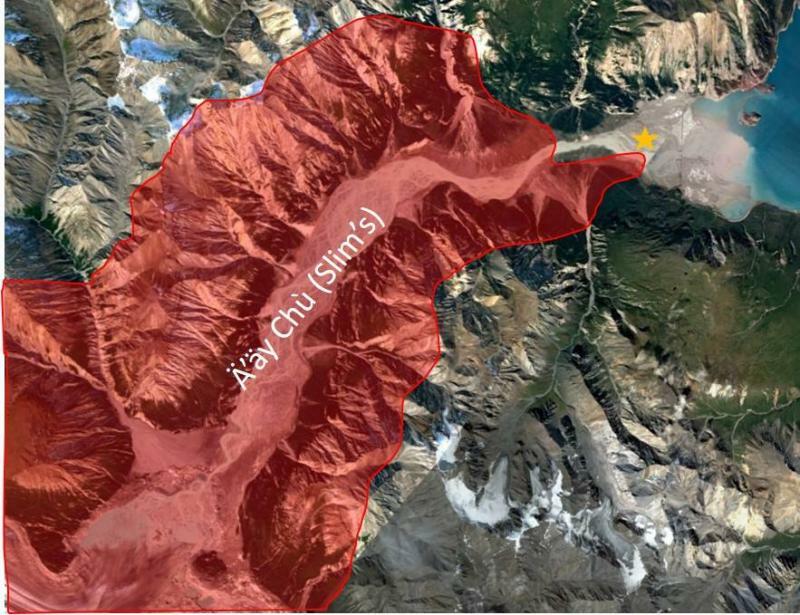 The Ä’äy Chù (Slims River) East and West Trails (not Sheep Mountain) as of June 28th. For more information call the Parks Canada Office: call 867-634-7250. A reminder to recent hikers that this trail has been CLOSED due to bear activity( whether you see them or not)and hikers should respect this as the bears are becoming habituated to humans. Please don't be one of 'those people' who disobey this and then when a bear approaches someone it ends up getting killed because it's now habituated and poses a threat. Just did it on Friday, 30th June, at 5 pm. 3,5 hours up, really exhausting. used this GPS-track, which is pretty good. start at the boat launch or soldiers summit parking, take enough water, hiking poles are helpful, good hiking shoes mandatory. the view is incredible up there. we saw many sheep, no bears were around. Hiked this "trail" yesterday (April 7, 2016). Lots of sheep, no signs of bears. No snow other than a few patches at the summit. 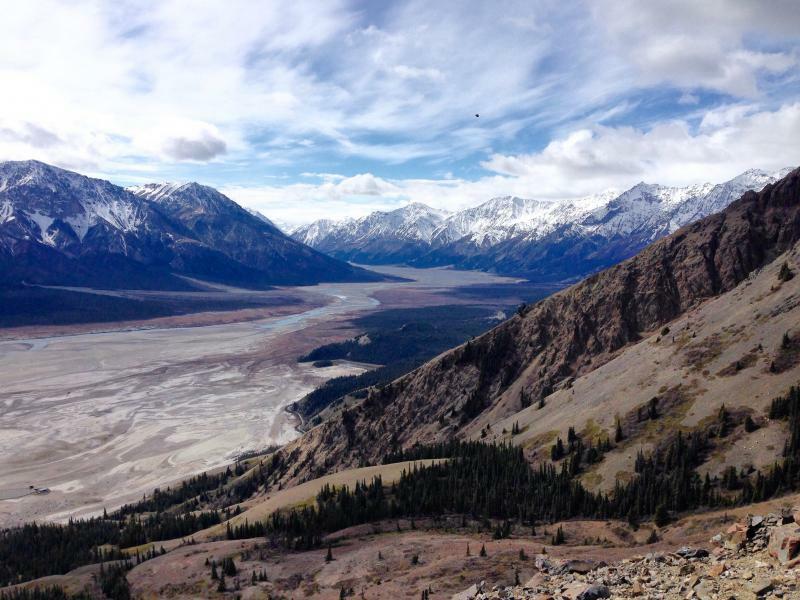 Breathtaking views of the Kluane ranges and Kluane Lake. Took about 4.5 hours including a lunch break at the top. Great hike! I would advise good hiking boots as you will be mostly following game trails or making your own trail along very loose rocks on very steep inclines. Difficult but well worth it. We hiked this mountain on Sunday, April 3/16 under a blue sky. All the snow is gone except for the last 20m at the summit and on the north facing slopes. The trail is in god condition and there are only a few spots where scrambling is required. Loose gravel sometimes requires good hiking boots, hiking poles might also good to bring for those that are used to them. Make sure to take enough water since there is none on the trail. 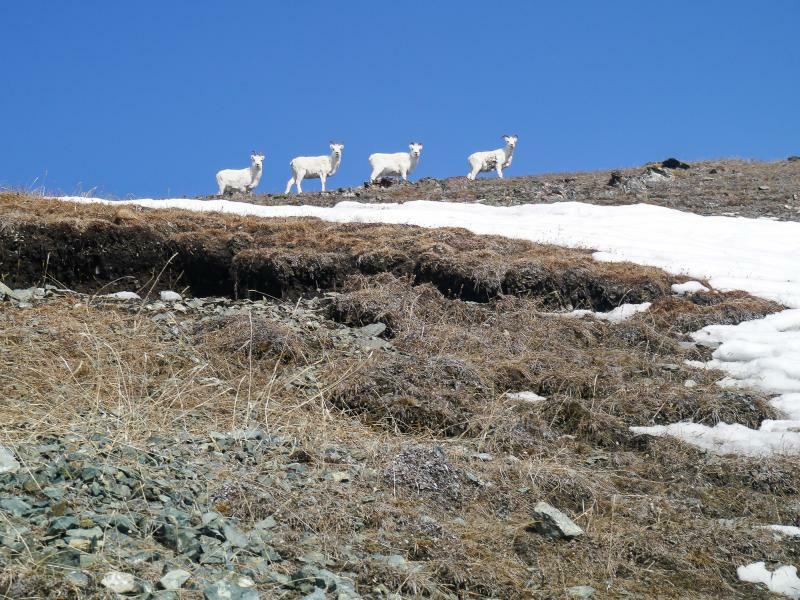 After the ascend from the parking lot we were welcomed by 5 sheep sitting at the summit and the breathtaking views to the Kluane Park Mountains and the lake were rewarding. A perfect time of year for this nice day hike. Climbed Tachal Dal aka Sheep Mountain Aug. 11/15 After following the trail described here,we found a friendlier trail down. If you enjoy scrambling on scree slopes and doing some free climbing, then this trail is ok for you. However, if you don't I recommend parking at the boat launch about 3km from the visitor centre. The trail starts right across the highway and there is no scree slope or "cliff hanging" required. This trail follows the steep grassy ridge on the south side of the poplar grove. You can spot the trail from the parking lot. The trail is steep but the views are worth it. Hiked up on a warm and windy day last week. The trail seems to present a couple of different options once about halfway up - I ended up on a ridge that I am sure was a bit harder than the 'normal' hike up. Other than this little detour, an enjoyable day. The views are stunning throughout - the Kluane Lake adds a whole dimension to the scenery here, a bit different from summit oriented hikes where we only see landforms but not large bodies of water. About 5 hrs total, ascent and descent. Saw a few sheep at quite a distance, and some dug-up meadows that seemed to be the work of a bear. We hiked up the Sheep Mountain trail on the weekend. The trail was completely snow free. It was hot and sunny, about 15°C. We saw close to 40 sheep on the mountain. We decided to hike up the depression to the left of the ridge because we wanted to avoid all the sheep above us that were on the ridge. On the way down, there were sheep everywhere and we couldn't avoid them. It took us about 5.5 hours return, and we spent nearly an hour on the summit in the sunshine.